Today’s guest post is from Jess Signet, an avid traveler who enjoys writing about her adventures. Knowing there’s more to the world than the bubble she lives in makes her want to travel even more. 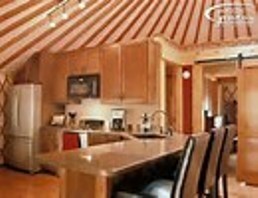 This new form of camping adds glamor to your typical camping trip and is one of my favorite types of holiday. Rather than heading off into the woods with a sleeping bag and backpack, glamping puts the fun and convenience into camping. Even though glamping is a new fad, there are plenty of places around Europe already catering to this style of travel. Don't get me wrong, I'm a big fan of camping, but camping often takes a lot out of a person. Sometimes you just need that relaxing holiday instead. With glamping you still get that outdoors experience and peaceful setting, but maybe you're within a WiFi zone still or can use a real shower or don't have to fend off thousands of bugs. First, you can ditch those ugly waders and clumpy hiking boots. Instead, bring a good pair of runners and yoga pants if you plan to hike or do other outdoor activities. Depending on where you're going, you may want to pack things that layer, such as a nice cardigan or a few long-sleeve tops. Even if you're going to a tropical beach, it can get chilly at night. Don't forget to bring a swimsuit since many glampsites have their own pools. You’ll also want to pack your electronic devices. I love to snap pics with my smartphone on trips, and glampsites often have WiFi networks so you can curl up to watch Netflix in the evenings. Just remember to install a VPN on your device prior to your departure. Otherwise, you'll find an obnoxious error message on Netflix and other sites that use geo-restrictions to protect copyrighted material from being viewed out of the country. Spain is breathtaking no matter where you go, but glamping will take you to some of the best places. Check out Chaparra Eco Lodge in Andalusia. It's in the foothills of the Sierra Nevada, and it's got everything you could want to do—horseback riding, hiking and swimming or skiing, depending on the season. Step out of your yurt to sweeping views of the orchard and the Mediterranean Sea. You can't beat the Loire River Valley if you're looking for a peaceful retreat, and Cosy Camp is a great choice for a glampsite. You'll have your choice of a few types of accommodation: canvas tent, treehouse, safari lodge, gypsy-style caravan or cottage. It's near medieval Chalencon, rock climbing, paragliding and a dozen other activities, and on those days when you want to chill around the glampsite, there’s an indoor pool with massaging water jets. Glamping in the UK offers the best selection for types of lodgings—from canvas tents to cabins and everything in between. If you're looking for a room with a view, it doesn't get better than Ffrith Galed Yurts in Wales. Step out of your comfortable yurt to stunning views of the emerald Welsh countryside and nearby Snowdonia National Park. Or get the rural England experience staying at The Old Apple Shed in Kent, where you'll be able to walk into nearby Bethersden, a quaint village with a couple of pubs and shops. 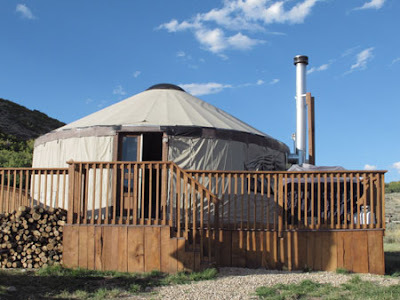 Yurts can be located in "camps" or in secluded areas. If you want the perfect, serene retreat, get off the beaten track. Lake Bled in Slovenia is one of the prettiest places I've ever been, and I recommend it. 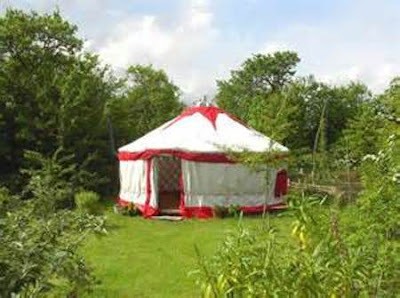 Stay at the beautiful Garden Village in either their tents or treehouses. Take a boat ride on the lake in the evening, hike through nearby Vintgar Gorge during the day and have a fantastic, romantic time of it.